There are many ways to illustrate biblical stories and themes. This Memorial holiday weekend is a perfect opportunity to give thanks unto our Heavenly Father for all the brave men and women who have served and given their lives for this great nation; sort of how Jesus gave his life that we “may have life, and that more abundantly.” Here are a few crafts that may help. Remember, be safe and you do not have to make a craft for every single student, just prepare one and watch their reactions! As for the lessons… well, YOU have to come up with those. Funnel about a third of a cup of dried beans into a patriotic-colored balloon. Inflate the balloon to slightly less than full capacity and tie the end into a knot. Attach red, white and blue crepe paper to the knot. Toss this rocket balloon to a friend, and it will travel quickly with streamers flowing. With a slight twist of the wrist, you can create some fun spiral action. Make a patriotic wind sock with a few household materials. Cut the end out of an empty round oatmeal or grits box or any other round cardboard container, then cover it with blue construction paper. Use star stickers or cut stars out of white construction paper and glue them onto the blue cylinder. Glue red and white crepe paper streamers or ribbons around the bottom of the cylinder. Don’t have crepe paper for streamers? Plastic grocery bags can be cut into strips for streamers just as well. Punch four holes around the top of the cylinder and thread two strings through the holes (going from one hole across to the one opposite it with each string). Tie the ends of the strings together. Cut small stars out of red, white and blue construction paper. (prepare several ahead of class to show students) You may want to leave a tab extended from the stars so it can be folded over the yarn and affixed. 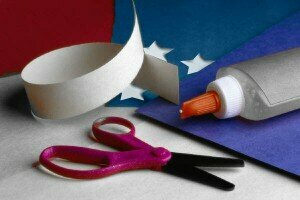 Decorate the stars with glitter and glue, patriotic stickers, or red and blue markers or crayons. Every few inches, tape, glue or staple the tab or the end of one point of a star onto a long piece of red, white or blue yarn. Repeat the process for as many streamers as necessary, and then use them to decorate a room with a patriotic theme. Sunday School teachers may —if you have the funds or materials— make several streamers ahead of class and decorate the classroom before the children arrive. If you really have a lot of yarn, the strings could be braided into red, white and blue. Another decoration would be to cut up old strings of tinsel into 1 inch pieces and glue or tape the small section of tinsel to the yarn. Blue, red, silver or gold tinsel would all work great to give that streamer some extra sparkle. Start a poppy wreath craft by cutting the center out of a paper plate to leave a round wreath shape. Paint or color the paper plate green. Glue synthetic poppies or other small, red silk flowers to the wreath. Tape a loop of ribbon on the back of the wreath to hang it. If time is short, prepare the wreath plate cutouts before class and paint them green before hand so all the children have to do is decorate and wait for the glue to dry. Have the children write their names on their plate before they start anything else, or write their names for them if they are too young. If you do not have any artificial flowers, use squares of red tissue paper. Cut the tissue paper into 2 inch squares. Wrap one square around a pencil and dip into a puddle of glue. Then place the glued square onto the plate-wreath until its fairly well filled up. Try making one ahead of class so you will better understand the skill level and time needed for the project. Using red construction paper, cut out four small hearts for each poppy you will create. Cut a small circle from green construction paper for the center of the poppy. Glue the hearts to the circle with the points meeting in the middle. You can then glue the heart poppies together to create poppy wreaths, or use them to decorate cards and other items.